Today the Times newspaper, owned by Rupert Murdoch’s News UK, and an arm of his global media empire that includes Fox News, a chunk of Sky TV and newspapers in the UK, the US and Australia, has called for an end to media monopoly… by the BBC. The general election campaign saw media mogul Rupert Murdoch’s newspapers sound the alarm for a free press. An editorial in his Sun newspaper on April 24 warned the Labour party was planning to censor newspapers if it won the election. “During all the years the Sun backed them from 1997, Labour said nothing about the size of our company. Now, as a direct result of the Sun’s opposition, it has sworn to use the law to dismantle News UK if it wins power. Dozens of innocent Sun journalists, later cleared, were prosecuted on the say-so of a man now standing for Labour. Meanwhile, the party vows to enforce the Leveson inquiry’s conclusions. It is all aimed at papers such as the Sun. Murdoch is said to have berated staff at the Sun for not trashing Ed Miliband enough, telling journos the future of the company was at stake. Now that the election is over and media ownership caps are likely off the table, Murdoch’s papers have changed their tune. “After decades of BBC bias against the Tories, subtle and blatant, it’s payback time. The fee should be shrunk so it focuses on first class original TV and radio. It must be regularly scrutinised for quality, value for money and neutrality. The piece is part of a right-wing drive to cut the broadcaster ‘down to size’, which probably means ‘a size small enough not to threaten the business interests of private media corporations’. The Sun more or less spelled this out, complaining the Beeb uses public money to ‘intrude into markets where private firms – local newspapers, for example – should thrive instead’. In the end, you either oppose ‘media empires’ and monopolies or you do not. Any attempt to create a genuinely freer market must address both public and privately-owned media to be taken seriously. Meanwhile, there is something ludicrous in complaining about ‘sinister state censorship’ of a partisan kind when your own interests are threatened and then cheer on ‘payback time’ for the BBC along equally partisan lines. Especially if you own one of the largest media empires in the world. Like this story? Click here to support MediaWatch via our crowd-funding page. Sign up for our weekly newsletter by clicking here. Payback time for helping the Tories into power. The beginning of the end of the most respected and diverse media organisation on the planet. Impartial news and views from media organisations not sustained by corporate advertising, R.I.P. Just one of the ways in which Murdoch manipulates reality, is by getting the rest of the media describe the Sun as a “newspaper”. According to the Reuters Institute of Journalism at Oxford, the BBC accounts for 70% of our news consumption. In any other industry, that would be an instant reference to the MMC, with a demand it be broken up. Goebbels would have loved him. Also, it is a State owned monopoly !!!! if we get 70% of our news from the BBC that is because we trust it and want it. Consumption is not the same thing as supply. Murdoch and his minions want to break up the BBC because we value it so highly and it is therefore successful. It should be sold off. The licence is just another tax. No it is an invasive PUBLIC FUNDED media entity with its own left wing agenda – tell the truth please. You mean like the Mirror, which strangely escaped the phone hacking allegations promoted by the BBC and Guardian. I wonder why as it now comes up they were worse than the NotW? Helped Tories? I think you will find that the Tories did not need any help as Labour were determined to lose the last election as it was in suicide mode. Now they must choose a “leader” from a small coterie of less than capable insiders. You must be on a different planet to the rest of us or perhaps employed by the BBC? A few days ago on radio 4 You and Yours programme the BBC were embarrassed by the response from BBC listeners and viewers who were unhappy with the BBC. They even had Alan Yentob on who dismissed one woman’s viewpoint on radio by recommending Wolf Hall on TV. You could not make it up. There’s already a government in power which can do what it likes, and you want to eliminate what’s left of the mass media that doesn’t support the Tories. Why not just declare your enthusiasm for a totalitarian state and have done with it? That’s a minority, hard right view. Most of us are proud if critical of the BBC. Right wingers want to destroy everything that is good about our country: NHS, BBC etc, whether for mad ideological reasons or to make money. And they want to ruin our economy by leaving the EU. Which seems to employ lots of Conservatives. What a load of rubbish. If anything, it tilts to the right. But right wingers expect all news to be right wing propaganda. They don’t understand the concept of journalism. Yes, Labour could have chosen to run their election campaign differently, with a more positive slant regarding their policies, but, with the greatest of respect, if you think the great majority of the national (and local) press haven`t helped or supported the Tories then you must have had your head buried in the sand and your fingers in your ears chanting la la la la la la…. for as long as you have been alive. Are you serious? – BBC relentlessly lefty – from Newsnight to Today programme & 5 Live – not forgetting the ‘specially selected’ audience for Question Time. Sarah Montague even gave game away this week when interviewing Labour guy with comment on how “we” lost the election. The BBC does not not have a left wing agenda by any meaningful definition of the term ‘left-wing’ – unless you are using in the American sense of anything which does not quackspeak ideoloically-correct fundamentalist Randian neoliberalism. In fact, the BBC has a lamentable record of failing to question right-wing orthodoxy, and adhering slavishly to the agenda set by the hard-right media moguls. Do ever actually listen to the radio? We are talking about the same BBC which routinely pushes a right-wing neoliberal agenda? We all have our perceptions of the BBC, but it is worth remembering that since it`s creation, large parts of the world have come to rely on it`s impartiality and in times of conflict, listened to it clandestinely, often in fear of arrest and death if caught, in preference to their own media. Bit paranoid aren’t we? And do you really expect them to be even handed on climate change? It’s pretty much a settled issue except amongst loonies. I don’t want my licence fee giving ‘balance’ to a bunch of flat earthers whose views have been discredited by science. Having one phone-in on the pain of austerity hardly counters the constant message put across by the BBC that austerity is necessary (in the face of all the evidence to the contrary). Far from being anti-UKIP, the BBC has given Farage endless platforms and opportunities to put forward his viewpoint – the fact that he used those opportunities to shoot himself in the foot is hardly the fault of the BBC. And as for the Tories, they’ve been given a far easier ride than Labour, and their agenda has been accepted without question. When have ever heard any serious questioning of Tory policies such as the creeping privatisation of the NHS? As for the alleged ‘warmest’ agenda, presumably you expect the BBC to give even more prominence to the vested-interests who back climate-change denialism, and to ignore the entire scientific community? And just consider the abysmal lack of coverage given to the Greens. The idea that the BBC is anti-Israel and pro-Hamas is just laughable. Hamas are routinely described as terrorists, while the war crimes routinely committed by the Israeli armies are never reported as such. Oh honestly… If 70% of news consumption is taken up through the BBC that is not because of lack of available alternatives (which is what monopolies are, in case you didn’t know) – far from it it. It is because people choose it over the myriad of news providers who are blatantly self serving money making manipulators. Last time I checked I still have to pay a tax on my food to fund TV stations that are funded through advertising. Unless of course you have a full and complete list on all products and advertisers so I can avoid this tax? Lets be honest no media outlet is perfect. That being said, I never see privately owned media outlets reporting on their own internal bad behaviour. The media should be held to a higher level of account then it currently is, including knowing who owns what and what they clearly stand for and want so we can make an informed decision on whether we consume their media or not. Finally as the recent scandal in the Telegraph has shown, private media can be held hostage by corporate sponsors, which undermines our ability to obtain accurate information. BBC news is available “free” at marginal cost (since the licence fee does not vary according to how much BBC news you consume), yet it employs some 7,000 journalists. That’s extremely predatory pricing that leaves alternatives struggling for sufficient revenues to compete: most newspapers run at a loss (unless they command a niche audience prepared to pay for quality coverage). That has all the characteristics of monopolisation of the market, in case you didn’t know. Time to tell Murdoch and his vile empire to f**k off. Point taken, sorry, I thought monopolies were when consumers don’t have an alternative to a particular provider. I’m grateful for the additional knowledge, thanks. If the right say BBC is on the left, & the left say the BBC is on the right. Then surely the BBC is impartial. Murdoch is simply one of the most dishonest individuals who has ever existed. For all the BB’s faults the great British public is correct to trust the BBC far more than Murdoch. It is a national shame how much power this man has held in the UK for decades. 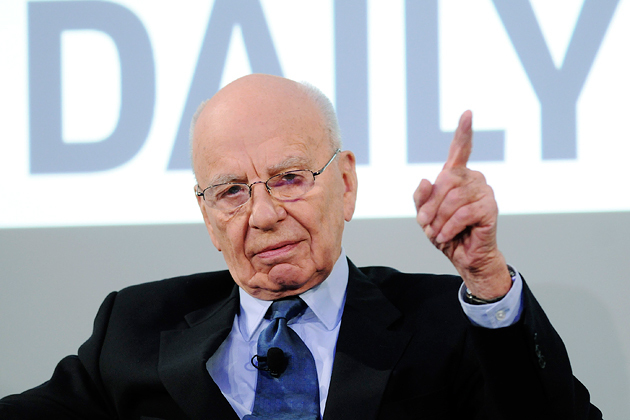 Murdoch has bullied politicians for years to get his own way at the expense of others. It is time this Australians influence over the UK ends. The last thing we need in the UK is for the BBC to be neutered to allow Murdoch even more power. If you do not use live TV you do not have to pay this tax. I think you will find the right wing press helped the Torys plenty. TV license that is the case I am referring every time you buy goods or services part of that goes towards advertising on TV which in effect is a tax as you have to pay it and have no control over it. No it is not a monoploly. A monopoly is -the exclusive possession or control of the supply of or trade in a commodity or service. please understand you are simply misunderstanding what a monopoly is. I can understand if you are frustrated that the BBC is funded by general taxation but please be equally understanding of my frustration that my tax also paid for the war in Iraq. If we were going to start with causes that were funded by tax payers we should not be starting with the BBC. Good luck in convincing people it is immoral to support the BBC through taxation but not the Iraq war. I think your missing the point of what I am saying. I am saying the double standards people have about the TV license how they argue it is a tax. While at the same time arguing for a system of television which is paid by advertising which we al end up paying for through the products and services we buy when out shopping etc. Yet we do not know which products and services pay for advertising. Yes Rupert how are we going to support a free press ?Perhaps we could start by creating laws which allow all journalists the freedom to follow their conscience without fear of sanctions or punishment from the owner/s of the newspaper .We could extend freedom by facilitating wider ownership of newspapers -trusts ,community groups etc could enjoy some of the freedom which you hoard …we can enable this wider access by limiting the number of titles which each entity is allowed to own ..maybe to one .. those who are unfit to run a newspaper will be limited to none -sorry Rupe. .Freedom will also be enhanced by putting the recommendations of Levenson into law..that is freedom for the public against the lies and distortions that come from your propagandist rag .Rupert you confuse oligarchy/plutocracy with freedom .We badly need a free press ..not one accessible only to the wealthy and which overwhelmingly represents an extreme viewpoint (over 80% of the UK press supports hard right wing policies )..
To me freedom is meaningless unless it is a shared freedom .We need a press which is responsible, accessible and which reflects a wide set of views. To Rupert Murdoch freedom means a tiny wealthy clique having the power to make journalists hone and select news items which reflect and promote the agenda of Murdoch and other wealthy neo-liberals .Murdoch’s model is fundamentally at odds with democracy .. I wouldn’t be too sure that the UK is more to the left than the US these days .The US tv news channel MSNBC is solidly left wing ..and promotes views which are to the left of most UK media outlets . The US have twice elected an Obama administration which has employed a partially Keynesian economic stimulus package in response to the 2008 crash ..at the same time our UK voters have just elected an austerity driven bunch of right wing nutters . Some of the strongest criticism of these right wing zealots has come from US economists Krugman,Reich and Stiglitz all influenced by the same Keynesian economic model which served post war Britain so well . Britain also has an unelected head of state ,whose position is a result of being born into a particular aristocratic family .Some of the more idiotic Americans may have a thing for the monarchy but less than 1% of Americans actually want to live under a monarchy. Now i’m not pretending that America hasn’t done a lot of right wing things ..including suppressing and locking up socialists and communists during the McCarthy era or creating a health system which is run in the interests of fat cat CEOs .and working to overthrow democratically elected socialist Presidents throughout South and Central America.However there is another side to the US ..that is the New Deal loving ,Wall Street Occupying ,Bernie Sanders /Elizabeth Warren supporting side . Good lord, if you think the BBC is left wing you must be perched on the wing where Mussolini sat! No, it’s because the BBC website (for example) is free at the point of use. Then if it is so wonderful then people will flock to subscribe to the BBC……….won’t they? Balanced issue? Settled science? It was the climate change ‘scientists’ who demanded that pieces sceptical of the idea of AGW were not published even if that meant changing what was meant by peer-review. It wasn’t the sceptics that deliberately altered their model because real life data was making the ‘scientists’ at places like UEA look like fools. Want to curb media ownership – right then, the BBC to have only one radio channel, one TV channel and a very limited website. Cut the Licence Fee to £20 a year and let people choose to subscribe to the BBC if they want more, just as the viewers choose to subscribe to SKY, BT Vision, Virgin etc. Surely if the BBC is so awesome, the Great British Public will, of their own choice, jump at the chance to fund it.